I want to share a mini album with you that I created using Imaginisce (Splash Dance collection) and Clear Scraps Mixed album. I admit that I've never made a "mini" album this size before so it was a bit of a challenge. This album is 6" x 12" which really leaves a lot to the imagination and use of a ton of photos! I really like seeing through the clear page to the page behind so I wanted my cover to be fairly "clear". 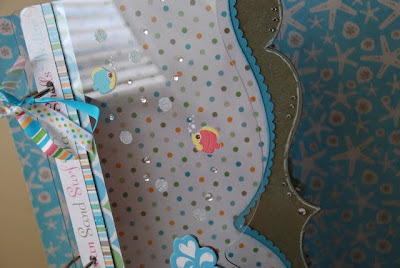 When I put paper/embellishments on the clear page I always make sure that it looks good on the other side afterwards. So in order to do this you really need to do a bit of pre-planning. For my cover I decided to put long strips along the left edge. I adhered these onto the front cover and then repeated that process on this inside of the cover. 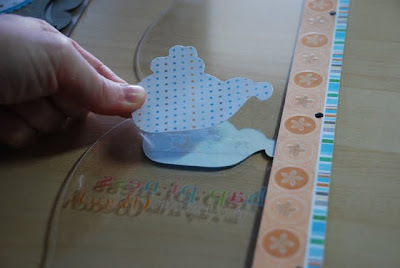 This way it covers up any adhesive from showing on the other side. (*make sure to punch out any holes after doing the 1st side otherwise you won't be able to find them very well later). Before I added a chipboard accent right on the center of my album I made sure to trace it first onto a piece of patterned paper. After adhering it to the front cover I then adhered the patterned paper piece on the inside cover to hide adhesive from the chipboard sticker. 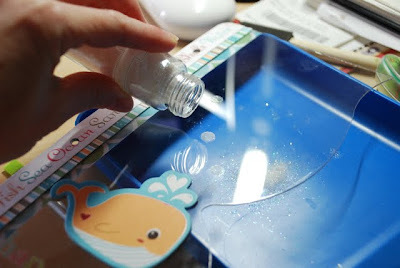 After placing the glue dots on the cover I then sprinkled glitter overtop of them. I did this one at a time so that I didn't have glitter everywhere. But I'm sure it would be fine to do a bunch all at once. 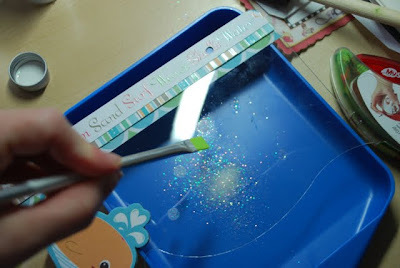 I then shook off the glitter & removed the excess with this nifty new tool a friend of mine has created. It's a silicone brush that removes glitter like a charm! After creating all the glitter circles I then adhered some clear hot rocks on the cover. I added the punched layers (waves) on the inside of the cover as well. On the chipboard page I sprayed the edges with Glimmer Mist and outlined them with a white gel pen, then added a few more rhinestones here & there. After adhering the paper to the chipboard pages I used my d-stress tool to sand around the scallops and it just finished it off perfectly. Here's the front cover (with photo added on inside page) and the inside pages. If you just popped by my blog and haven't had a chance to check out the Imaginisce blog - please make sure you do so. Cause there's an awesome prize give away. You could have a chance to win an i-rock, i-rock accessories, and a Clear Scraps Mini Handbook album!!! 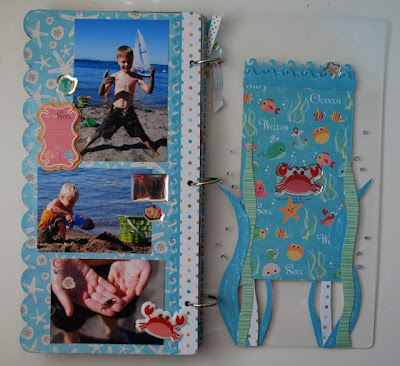 Thanks for the great pics on how to make a clear mini book picture perfect! You have totally inspired me with your pretty project. You did an awesome job with the album! I love your album, the cover is beautiful. Awesome job, TFS. This is seriously creative! LOVE how your created the water effects and what attention to all the details. You can truly tell you love this craft. I just found your blog and am now a follower. So very nice to meet you. Stop by my blog sometime soon and give me a shout out! absolutely adorable!!! I love your blog, just became a follower AND you hit 300! Woo hoo! thanks for sharing. I just found your blog through the imaginsce site and I am now a follower. I love the mini album that you created. Absolutely fabulous. 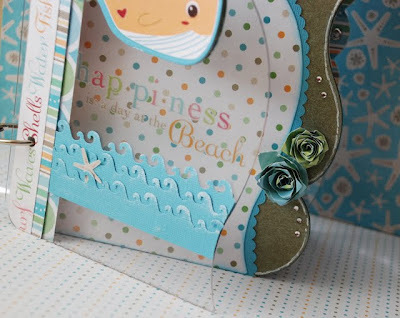 Oh so cute and beautiful project, i love all details!! Congrats!! Really, really love this album. I have some beach pics that I need to put into something. This gave me a great idea. Thanks so much for sharing your talent. Fabulous mini you created!!! So amazing. Thanks for sharing! Love the album. Thanks for the instructions..going to look for one of those pogo glue dot thingys. 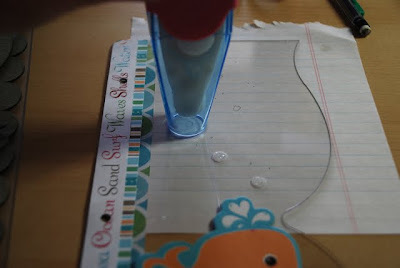 Wow Cari, you really rocked the Clear Scraps! Your album is stunning. What a beautiful mini! 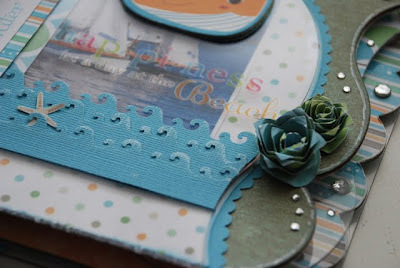 !I love the water theme! How cute! I love the glitter bubbles on the cover. 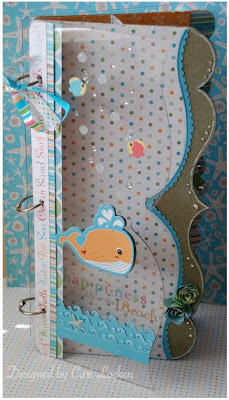 TFS this adorable book! Oh my gosh!!!!!!!! This is soooo cute! And I'm LOVING that little brush too! Where can I get one? adorable. thanks for the instructions. Wow, this is fantastic. What a creative idea. TFS. What a gorgeous mini! The theme goes so well with the acrylic album... as clear as water! Love the technique of the glittery glue dots! I must get myself one of those silicone brushes! TFS! I love your album! Great job!! adorable....and thanks for the tips on leaving the cover clear!! Oh my gosh... I am IN LOVE with this mini!! I truly love everything about it... there are so many beautiful little details ~ just gorgeous!! :) Thank you for sharing this with us all, I am definately inspired! Your mini are so sweetie!!! Thanks so much for the tips since I don't usually work with acrylics. Just by looking at a photo you can't tell all the steps involved. 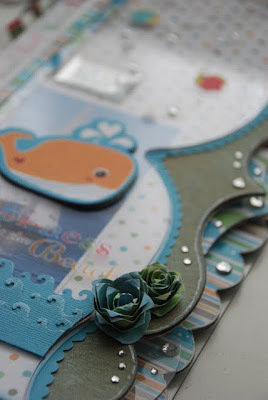 What a gorgeous album, I especially liked the paper pieced seaweed with the little crab. So cool! Love those bubbles and the end with the seaweed! Great stuff! Love this album and love the hot rocks! I have never heard of them so its on my list of things to get now! love the way it looks on this album. 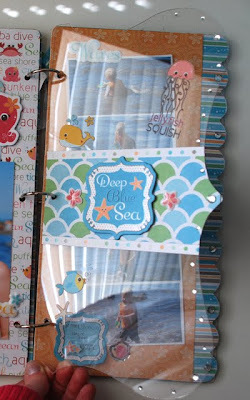 I love mini albums and I love beach themes so this one is perfect. I also want one of those silicone brushes! Where can we get that? I really love this album! Good job! love the album! thanks for the tips. Love this album! Thanks for the great instructions. Great album, thanks for the tips & tricks! love it the paper is super cute too!!! 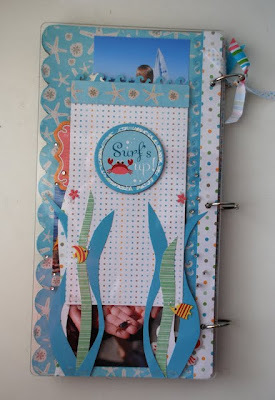 This is the perfect shape for a water themed album!Thanks for all the great technique and tips on how to add the shapes and bling to the clear pages. I may have to try one now! Adorable! 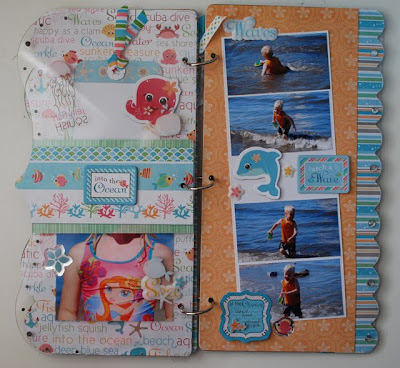 I have a baby album on my list of gifts I need to make and this clear mini would be perfect! Thanks for all the wonderful tips! 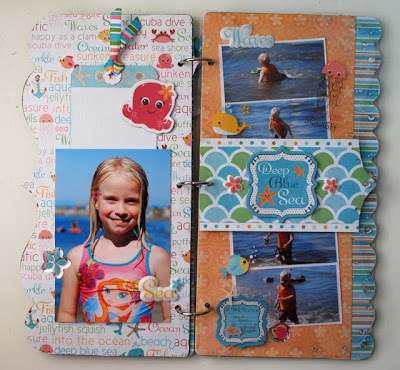 So many different techniques and bright colors add up to one cute album ! Great album and love the bling and glitter on the front. Awesome project! I love all the details. This is sooo very adorable. I love all the details. TFS! I am a new follower and I look forward to seeing more from you! Love this album it is sooo sweet!! Such an awsome album, thanks for sharing! Awesome mini album. I just LOVE the Splash Dance collection & made a mini album of my own from it. 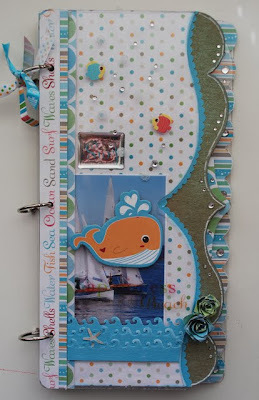 You can see mine here: http://craftingthismoment.blogspot.com/2010/08/summer-fun-mini-album.html TFS! What an adorable album. I am loving the acrylic after taking a class from Clear Scraps at CK Manchester. Thanks for the step by step instructions on some of your techniques, they were very helpful. Beautiful album and I love that you took the time to explain the whole process, thanks!!! Oh my gosh!! this turned out so so cute!!! I have never made a mini album, much less a clear mini. Thanks for the step by step!